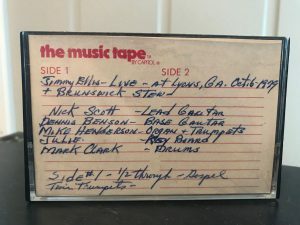 From the personal collection of one of the musicians that played this night comes this super rare cassette recording. Recorded by the musician to bring home and listen to for reference. What is rare about these two shows is that Jimmy had already been signed to Sun Records and this is one of few surviving concert where he still performs as Jimmy Ellis even after becoming Orion. This show is from October 6, 1979 while Orion’s first show was September 29th, 1979! How is that for a rarity!? Please note that the original cassette was in poor shape, so to protect the original tape inside I took it out and placed it in a new cassette holder. This way it will be protected best possible. Tape plays fine though.